The Alaskan Malamute originated in Alaska as a sled dog. The dogs were originally domesticated 2000-3000 years ago in a native tribe of Alaska known as the "Mahlemut" tribe. They are descended from the arctic wolf and have amazing endurance and will to work. The malamute is genetically one of the oldest dogs, and closest descendent of the wolf. 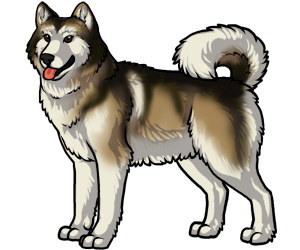 The malamute was of highest value to the Mahlemut tribe because it was their only form of transportation. The malamute and other sledding dogs were used extensively in the 1896 Klondike Gold Rush.